Everybody knows that a peanut butter or jelly-covered knife laying on the edge of the sink means you haven’t decided if you’re going to make another sandwich or not. This keeps the counter free of smears, and it keeps the knife clean – so long as it doesn’t fall into the sink. You won’t have to play balancing games to keep your sandwich spreader clean with the Tirso Standing Spreader Knife. This stainless steel, 8.5″ X 1.5″ spreader is made with a rounded, balanced base to keep it upright and clean. At 0.5 pounds, it’s heavy enough that it shouldn’t tip over easily, but it may give your sandwich-making arm a workout. 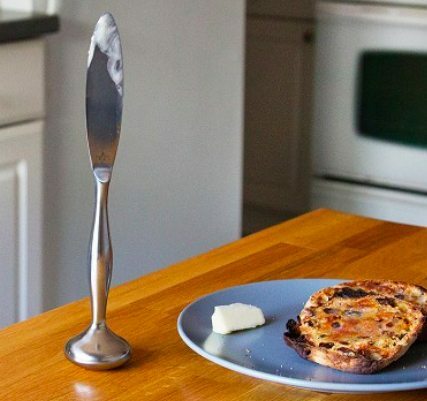 (And since it’s described as a spreader, you don’t need to worry about a machete-sharp killing machine falling over and killing everyone in the kitchen…) It’s manufactured in China by IPAC, and it’s available for $19.95 at The Grommet or for $30 with free Prime shipping from Amazon. I’m not trying to be a health and safety party pooper but that things just looks dangerous! It’s a spreader, so it should be dull and not capable of cutting you. However, as it weighs half a pound, you could probably give somebody a concussion if you cracked them in the head with it! Funny, I just saw this plastic version by the same company at Amazon for $11. It’s less than 4 ounces, so you don’t have to worry about getting an arm workout nor a concussion from it, and it’s plastic, so no worries about cuts. Just don’t sit on it. What incredible nonsense! This knife is intended to stand, it doesn’t. The base is…[get ready] ROUNDED! It topples!